The 2nd edition of Festivalito Querido Tango Bilbao is coming soon! From the 16th to the 18th of February. Let the breathtaking coastal cliffs, our beautiful wooden dancefloor, famous food and intimate workshops and milongas whisk you away until your feet can’t handle anymore. Take advantage of our unique location only 10 km from Bilbao Airport, to take seminars with Mundial Tango Pista Finalists Dante Culcuy and Miriam Orcutt and with the young and dynamic couple Borja Alcalde and Christina Gomez. We have a jammed packed weekend to keep your bodies and bellies happy! At our all night milongas, our Super DJs won’t stop until you drop. And don’t miss out on Vermut and the famous Bilbao Pintxos at the Saturday Matinee milonga. Can your feet hold up? Please note the Early Bird period ends on December 31st 2017 so get in there quick. Follow our page on Facebook to get all the updates and like our FB event page! 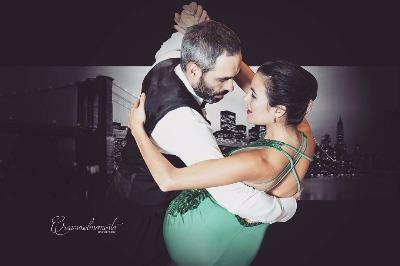 Borja Alcalde and Christina Gomez run Querido Tango school in Bilbao, Spain. Our school is new, young and friendly. We organise regular milongas and classes in the area with the aim of growing the community of tango dancers in the area. We also organise Festivalito Querido Tango in February each year, with the help of our friends and helpers. We travel a lot around Europe to different events and love getting to know new dancers and new cultures, so let us know about yours! Can you give some more information about this festival?